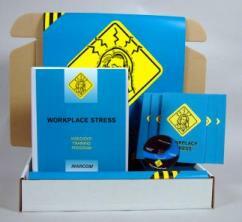 MARCOM's "Workplace Stress" Safety Meeting Kit™ helps employees identify potentially stressful situations and learn how to cope with them. In the fast-paced world that we live in, we are always encountering situations that can be stressful. Many of these occur at work. Yet stress, and its effects on our ability to do our jobs, is a subject that is often overlooked. Materials in the kit include a video program, five motivational posters, and 30 employee booklets. The Posters remind employees to work safely and avoid injuries. The videotape and employee booklets include information on situations causing stress, positive versus negative stress, recognizing symptoms of stress, effects of stress on the mind and body, eliminating "stress factors", stress-relieving exercises, and more. The video program in the kit comes with a comprehensive leader's guide, reproducible scheduling & attendance form, employee quiz, training certificate and training log.